Yeah, but: Running out of ink scares me. The Long Version: Today Mike Johnston wrote an interesting article on The Online Photographer, lovingly (and perhaps provisionally) titled "A Specific, Detailed Program for Absolutely, Positively Getting Better as a Digital Printmaker". Essentially, the Specific, Detailed Program is a daily exercise that's intended to become a self-guided course in making and examining inkjet photo prints, and should last for months or more. Becoming a better printmaker is one of my big goals for this year, so this immediately piqued my interest. I'm also 70% of the way through another daily photography project, so I'm already in the habit of being in the habit of an ongoing task. Finding another fifteen or twenty minutes a day seems like an attainable target. I'm committing to starting this no later than the beginning of June, and running it until at least the beginning of September. I've decided to keep my prints on letter-size paper, both out of space and cost concerns. Somewhat countering the second point, I'll probably stick with my two favourite "for real" papers, even though they run about seventy-five cents per page. Saving sixty cents per print by putting ink on cheap plastic feels like it won't teach me as much about printing what matters to me. I'll keep this post updated as the process goes on. I'm interested too, and very much considering this as far too many of my pictures end up lost in my hard drive and not breathing somewhere on paper. Of course... my printer is 6 years old and though it's a "Photo" printer, I don't think it's quite up to the task. Still... might just give it a shot. And I'm very interested as well. Looks like I'm going to have to break down and get that printer. Except I think I'll start modest. If I'm not buying thousand dollar cameras, then I'm not buying thousand dollar printers either. Jayson, Mike Johnston does warn that the process might lead to some equipment changes. I'd see this as a good opportunity to learn what's important before spending on the upgrade; I tend to do it the opposite way, which isn't all that smart. Bill, if printing wasn't a passion before, then there's no reason to start now. 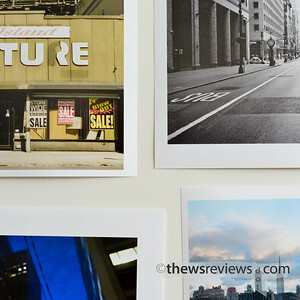 But I have to say that buying a decent printer did change how I think about my photography.